The most commonly used knife in the kitchen. The Gyuto is a Japanese designed chef’s knife. Gyutos vary widely in design but generally range from 210mm to 270mm in length though smaller and larger examples can be found. 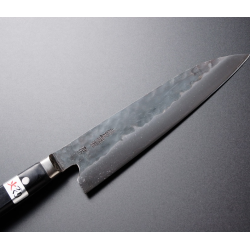 Like the familiar western styled chef’s knife, Gyutos are commonly tall at the heel, have a reasonably flat profile toward the heel for chopping, a belly toward the tip of the blade for rock cutting, and a pointed tip for precision work. For most users a Gyuto is practically the only knife needed in the kitchen. While specialized knives may be easier to use in some applications, there are few chores that a Gyuto cannot do in a pinch. Gouty:Inspired by the profile of a traditional European chef knife, Gyutos are a multi purpose knife..
Gyuto:Inspired by the profile of a traditional European chef knife, Gyutos are a multi purpose knife..